I’m not a big believer in happy endings,I’m afraid. 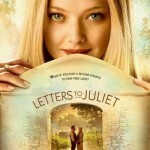 a romantic drama that stars Amanda Seyfried and is directed by Gary Winick.Letters to Juliet quotes,quotes from love movie Letters to Juliet,like those quotes,don't forget share them with your friends. I'm not a big believer in happy endings,I'm afraid. We’re supposed to want to be with each other all the time. Cause the truth is,Sophie,I am madly,deeply,truly,passionaely in love with you. I would do anything to be with you.